New to LASIP? It's free and easy. Belgium's Eric Palante at the start of the 2014 Dakar Rally in Rosario in Argentina. The Honda rider died on the fifth stage of the event. 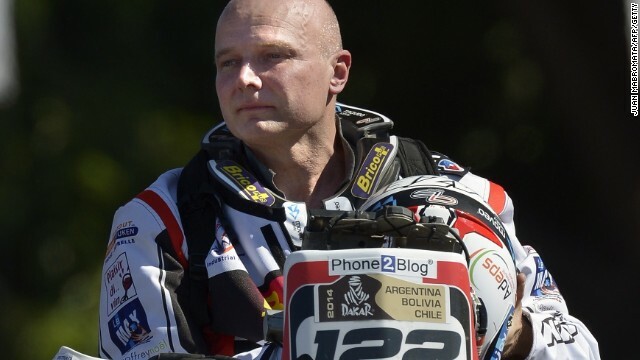 (CNN) -- The Dakar Rally claimed another victim Friday, as organizers announced the death of an experienced competitor in the motorbikes section. The body of 50-year-old Belgian Eric Palante was found at the 143km mark of the previous day's stage from Chilecito to San Miguel de Tucuman, the longest of the grueling race. A support truck had gone in search of the rider, who had been missing overnight after the 911km marathon leg. Two members of a local Argentine news team also died while following Thursday's fifth stage when their car plunged into a ravine. Organizers of the annual event said Palante's death would be examined by a judge in the Catamarca Province of Argentina, but reported on their official website that "no alert" had been received ahead of his fatal accident. They paid tribute to the Honda rider, who was bidding for victory in the amateur motorbikes section: "He knew the race very well, and over the years his enthusiastic but serious approach had made him one of the pillars of the event. "It is with great sadness that the organizers and the entire family of the Dakar offer their condolences to Eric's family and friends." Palante is the 27th competitor to die in the rally since it was first staged in 1978, while more than 50 have died overall, including spectators, support crew and the media. The marathon motor rally, for cars, motorbikes and trucks, was originally staged between Paris and Dakar in Senegal. It was moved to South America, principally Argentina and Chile, in 2009 because of threats of terrorism. Lasip.net reserves the right to exclude postings that contain insults, bigotry, sexism, racism and other expressions deemed to fall outside the bounds of decency. All opinions expressed are those of the individual poster and do not represent the views of Lasip.net or its staff. AVAST, AVG ,Norton or McAfee antivirus which is regarded as one of uppermost antivirus across the globe and simultaneously protects compatible devices from dangerous malwares and viruses. Don’t worry we have top notch solution provider as our Avast antivirus technical service is available 24*7*365 if one faces error for this simply be connected with our toll-free number+1-844-534-8410. There are multiple operators who proffer solution for entire technical issues faced with avast antivirus. We are one of best Avast,AVG,Norton or McAfee antivirus service provider to clarify each and every issue within stipulated time period.